Dulux Padded Leaf was the perfect tone of calm for the walls. There is no denying we live in a world of social media. For me, I find it a blessing. To be inspired and entertained by creatives around the world at the touch of a button is a gift. 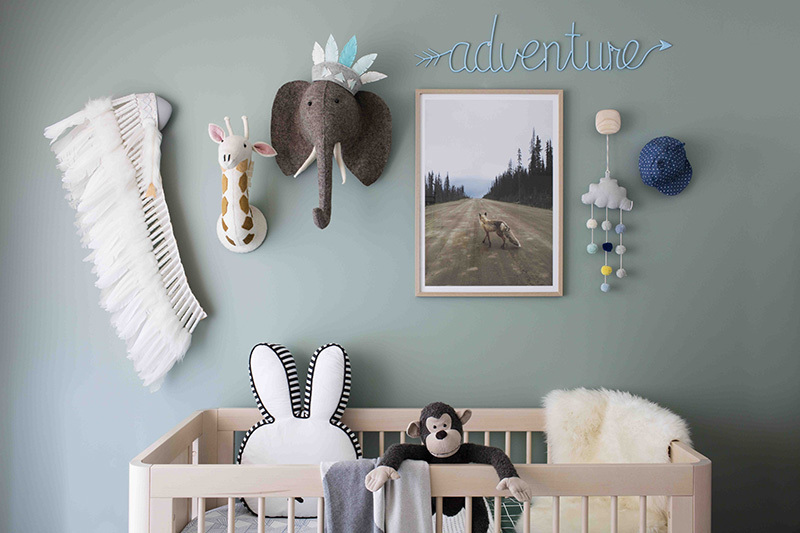 For Ally Batties, stylist and mum-to-be, the simple act of sharing her newly completed nursery to her friends on Instagram quickly turned into much more. The nursery was noticed in a big way. Industry heavy weights were sharing, comments were pumping and I knew we had to see more. Ally is a self-confessed design and style addict. Ally has over ten years experience working as a Visual Merchandiser, Property Stylist and Interior Stylist in Melbourne, Australia. She is a passionate and fun creative on a mission to create the perfect nest to enjoy at the end of a crazy day. About to embark on her biggest challenge to date – life as a new mother – Ally drew on her years of experience and drive for good design to create this warm and calm space for her precious newborn, Levi, to grow and learn. “We wanted our baby boy to grow up in a room that felt fun, whimsical and interactive but we also wanted it to feel calming at the same time” says Ally. The Essentials: Troll Sun Cot from Baby Mode and Francesco Bellini Rocking chair from Life Interiors. On the Cot: Navy Origami fitted sheet by Pear and Co.; Grid Reversible Quilt by Miann & Co; Kate and Kate baby blanket; Cutest monkey in town from Citta Design. Upon arrival at the home, the feature wall was as breath-taking as the images suggest. The opposite wall however, was an equally exciting surprise. Ally’s attention to detail shines with an eclectic mix of vintage and modern; textures and levels a feast for the eyes. The colours add depth and the terrarium housing a beautiful fern brings more warmth and life to the space. The Francesco Bellini Rocking chair cannot go unmentioned. It is stunning and so welcoming. The Kenza rug by Freedom ties the two areas of the room together perfectly. Textural enough to create interest, and perfectly neutral to not compete with the features in the room. Sweet little details await baby Levi. I love this room. It is every bit as warm and inviting as it looks. I have no doubt Levi will grow into this room for many years to come. For now, newborn cuddles on the rocking chair, little eyes on the dreamy mobile and tiny hands exploring the textures will affirm the inspired choices Ally made for this space.